Hope you had a lovely Christmas and all my best wishes for 2017. A very busy few months leading up to the festive season where I met and talked to lovely people. Sreepur cards, scarves and other gifts sold well- ideal for Christmas gifts. I am sure they will all be appreciated by friends and family all over the world. I know our Liverpool scarves and cotton bags have been sent to all corners of the globe. I spent a cosy afternoon at St David’s Church on Queens Drive and also at Dovedale Baptist Church talking about Sreepur. Also the Warrington branch invited me to their meeting- I have talked to them on many occasions over the last 20 years. They are so supportive of my work and on that evening we raised £500.00. Another talk was at the North Cheshire Lacemakers in Helsby, who I have spoken to in the past. 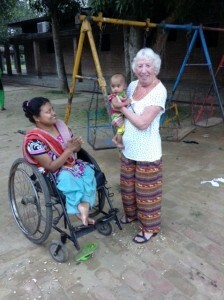 They enjoyed an update on life at Sreepur and again £500.00 was raised- people are so kind. 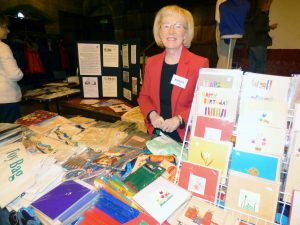 I was at the Christmas Art and Craft Fair in St Matthews Church, Wigan and raised £299.99. Then I was invited to talk to members of The Friends of Allerton Library which was also open to the public to attend, and once again met interesting people. My last talk of the year was to Fine Art students at Hope University on a very cold morning but we got a warm welcome. May I thank you all for your support over the last year- without you all I could not do it all. 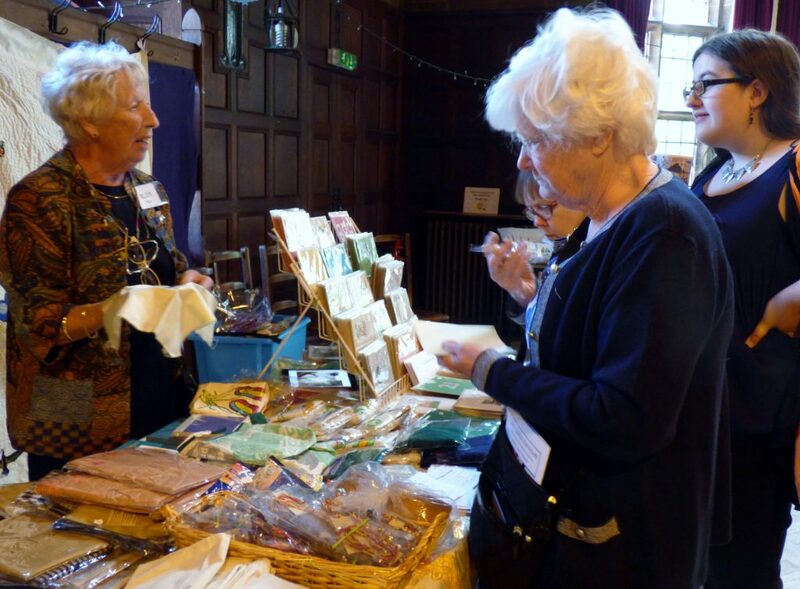 Kathy Green was in charge of the Sreepur stall at Merseyside branch Winter Fair, which was held in Unitarian Church hall, Ullet Road, Liverpool L17 2AA on Saturday 19th November. 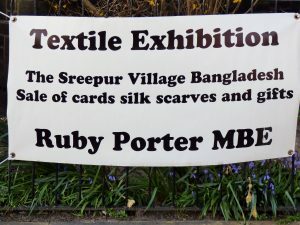 Ruby made a brief appearance and then went off to hold another Sreepur stall at a different venue. 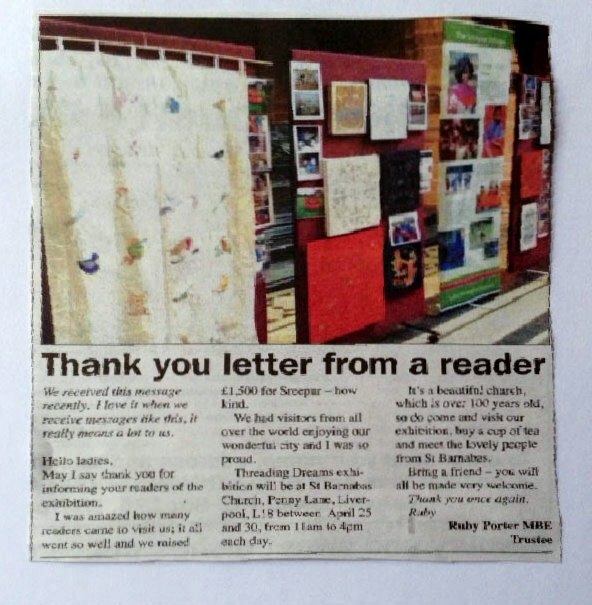 My Sreepur “Threading Dreams” exhibition at St Barnabas Church, Penny Lane, Liverpool was enjoyed by all our visitors. Loretta, one of the Sreepur sponsors, came to visit from the Isle of Man- how lovely! Kathy, Norma and I put together a Sreepur quilt. 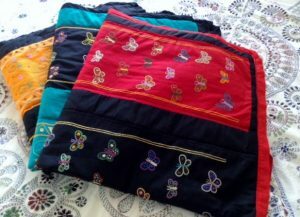 The children from Sreepur did the embroidery on the squares when I visited Sreepur in May this year. Another excellent “Threading Dreams exhibition at the Readers Gallery, Calderstones Park, Liverpool. We raised £1121.00 and we met so many lovely people- some old friends and new, all interested in my voluntary work at Sreepur over all the years. Please thank all who visited the exhibition and helped to raise this money, people are so kind. We had an excellent “Threading Dreams” exhibition at Liverpool Town Hall. We raised £3532.00- people are so kind. May I thank all MEG members who came along- you are so supportive of my work at Sreepur. I would like to thank my sister Kathy for being there each day with me, and also Ken my long-suffering husband for his support. Ken and I went to Manchester Central Library to an amazing event. 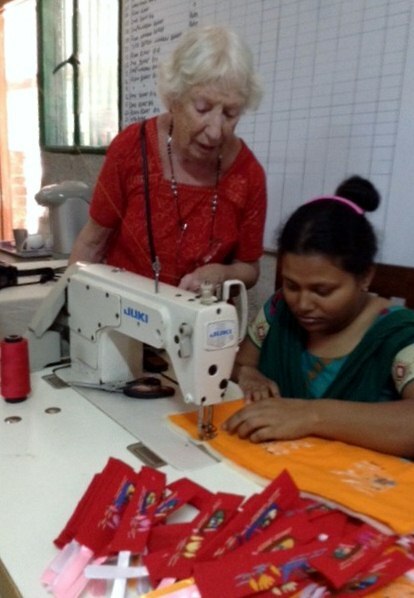 Lynn Setterington, a member of the 62 group and head of textiles at Manchester School of Art, invited us to an exhibition and presentation held by the Manchester Bangladeshi Women’s Organisation. Lynn has been teaching Kantha embroidery, and it was beautiful. A wonderful evening- Ken did enjoy the curry! Lynn and I have been friends for many years. At the beginning of June Janette, Ken and I went to London for the Trustees meeting. 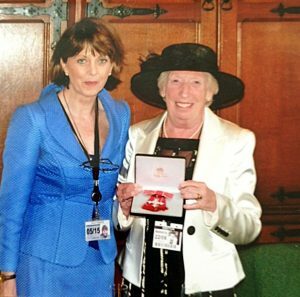 It was the day of the Queens Official Birthday Celebrations and one of the trustees, Dr Sheila Fitzpatrick the wife of Jim Fitzpatrick our patron, was awarded an MBE for her work for charity. We were all delighted. The trustees loved seeing the photos of Shabiter’s embroidery in our exhibition. On 15th June Ken and I went to Daventry as Ann Rogers had invited me to talk to the Daventry branch of the guild. I was made very welcome and had a lovely evening. 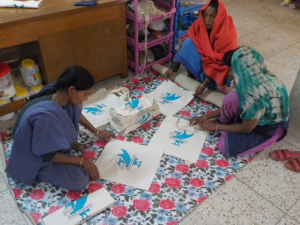 We raised £300.00 for Sreepur- they loved all the hand embroidery on the scarves and bags and were so interested in our silk wall hangings, and liked the way our Branch worked together with Sreepur mothers. The Merseyside Women’s Movement held an event at Bluecoat Chambers. 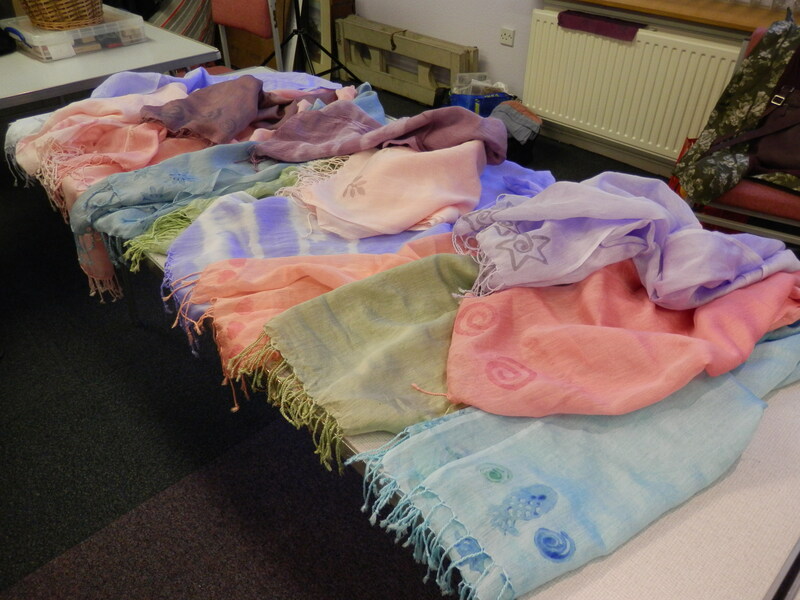 They sold Sreepur cards and scarves and £90.00 was raised. This excellent group have been so supportive of Sreepur for many years and raised thousands for our destitute mothers -how kind! Ruby visited Merseyside E.G. “60 Glorious Years” exhibition at Liverpool Cathedral this morning. while she was there she presented an MEG cotton bag made in Sreepur to Liverpool Lord Mayor Cllr. Roz Gladden, who was also visiting the exhibition. There are also photos of some work which is in the exhibition. 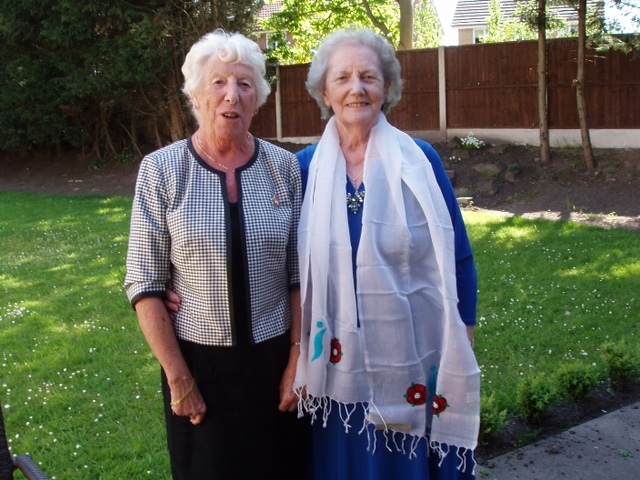 On Sunday I was invited to a cream tea at a hotel in Widnes by the Soroptimist International. It was a lovely afternoon and I met interesting people. The lady in the photo is wearing a Sreepur scarf. They asked the mothers at Sreepur to make 100 scarves for all the members to have as a gift for their 70th Anniversary. 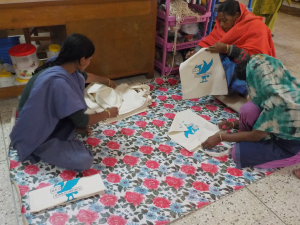 The Sreepur mothers loved doing the embroidery of their logo design, and the members loved them. I was made so welcome when I went in to talk about Sreepur last year. We wish them both well on their journey, and look forward to lots of photographs on their return to Liverpool. Ruby and Kathy were here with their Sreepur stall. They had a lovely day and met many friends old and new, who supported the work at The Sreepur Village in Bangladesh. Ruby and Kathy raised £442.00. How kind, an amazing amount! Ruby and Ken are looking forward to their visit to Sreepur, Bangladesh next week with lots of donations of sewing equipment. We wish them bon voyage and look forward to some more lovely photos. May I thank you for informing your readers of the exhibition. I was amazed how many readers came to visit us; it all went so well and we raised £1500 for Sreepur- how kind. We had visitors from all over the world enjoying our wonderful city and I was so proud. 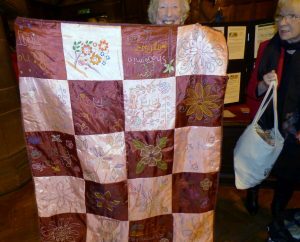 Threading Dreams exhibition will be at St. Barnabus Church, Penny Lane, Liverpool L18 between April 25 and 30, from 11am to 4pm each day. It’s a beautiful church, which is 100 years old, so do come and visit our exhibition, buy a cup of tea and meet the lovely people from St. Barnabus. Bring a friend- you will all be made very welcome. years ago. They all enjoyed my update on the work at Sreepur and my slides. I showed them one of the first Industrial sewing machines I bought with a donation from one of their members- it’s still sewing well. Parul who is disabled has the use of this machine, I had it modified for her to use. Parul has been living at Sreepur since she was a baby and she is now a mum with a little boy of her own. Her husband is employed as a guard at Sreepur. May I thank all our members who visited the Sreepur exhibition at Liverpool Cathedral last week. It all went so well with lots of visitors from all over the world. I had a lovely week talking about my work in Bangladesh. The beautiful Bangladesh silk wall hangings with embroidery from our branch member and the girls and mothers from Sreepur looked lovely in this magnificent Cathedral and very much admired by our visitors, plus the traditional Kantha work made by amazing women in adverse poverty. We raised £1500.00. People are so kind- all this money will go to the Sreepur Village in Bangladesh. 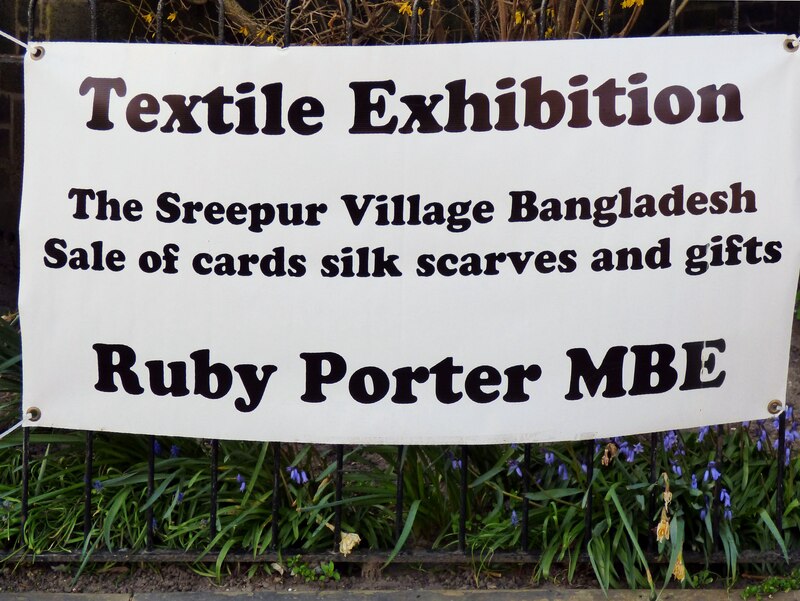 Ruby has been busy all this week from 14th February to 20th February with her Sreepur charity stall and Threading Dreams exhibition of kantha embroidery at Liverpool Anglican Cathedral. 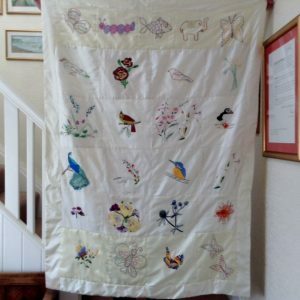 There are hand made cards, silk scarves and other gifts for sale, and she has sent us some photographs. 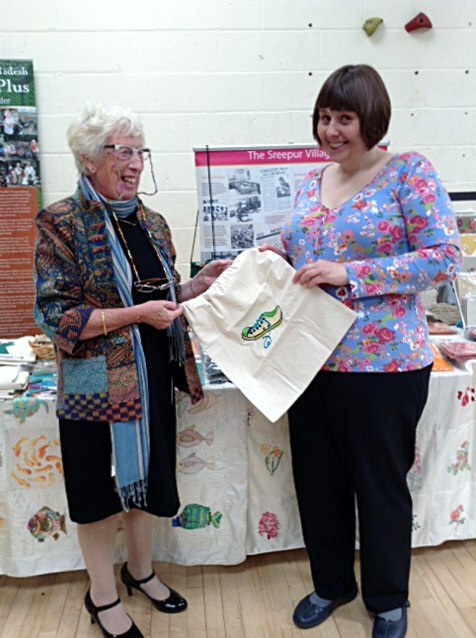 Merseyside Embroiderers’ Guild are having some bags made in Sreepur which feature the new MEG logo. 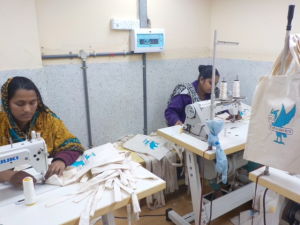 Ruby has just sent some photos of these bags in production in Sreepur, and they look fabulous! 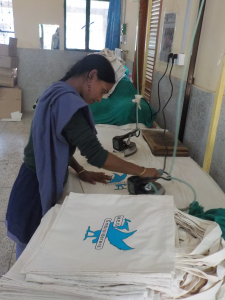 They will soon be available to purchase at MEG meetings and exhibitions, and on Ruby’s Sreepur stall.